There has been a lot of innovation in recent years which has helped to bring galleries and museums to new audiences. Our reviewers, disabled people and their friends and family, have been visiting some amazing places all over the country and we’ve had some great feedback. We’ve compiled their top tips. Our visually impaired reviewers reported that these are a great way for people to gain a deeper understanding of exhibits. Touch tours are not just about letting visitors touch the exhibits but become much more meaningful when staff are available to describe the objects and place them in context. A popular approach is to build a 3D model of the objects for visitors to feel and explore. Touch tours work for everyone and are very popular; particularly for children. Space is very important for wheelchair users to enable them to manoeuvre in the museum environment. Keeping exhibitions spacious and clear of trip hazards is important. It is also great to have a space beneath the tables on which objects sit making it easier for wheelchair users to get close to the display. One reviewer told us this was great for them as they use a wheelchair as well as having a visual impairment and liked to be close to objects in order to see them clearly. Keeping objects protected from light exposure is vitally important in terms of conservation. However, it can make it difficult for some visually impaired visitors to view artefacts. London Canal Museum has a great solution! Next to exhibits with low level lighting, there is a button which increases the lighting level for 30 seconds, perfectly balancing conservation with accessibility. Self-guided tours are common in many tourist attractions and allow visitors to explore at their own pace. The Royal Yacht Britannia has a self-guided tour in British Sign Language (BSL) and the Cutty Sark launched an audio described tour earlier this year. Having a range of alternative formats easily available is good practice. Some can be created easily, like large print, and others may require external assistance, like Braille. Some visitors, often wheelchair users and visually impaired people, might find it difficult to read the signage accompanying exhibits. A great solution is to provide a large print printed guide as a spiral bound booklet. This explains the journey a visitor makes and the exhibits and displays a visitor can see. Spiral bound booklets are prefered because they can be folded and placed on the lap of the wheelchair user as they move around and can be easier to use with a portable magnifier. Often disabled people travel with a carer, may use a larger style wheelchair or be accompanied by medical equipment. When this is combined with a large number of elderly visitors or parents with prams it can lead to congestion as people try to use the lift going in different directions. One of our reviewer's favourite lifts is to be found at the Scottish National Portrait Gallery, in Edinburgh. The lift is large enough for a small car to be transported and has large windows allowing visitors to see the exhibits on each floor as it moves through the building. These are becoming more popular and are generally very easy to set up. Simple steps like advising when your museum is quietest can be helpful for people planning a visit. Sometimes people with autism need a quiet space to relax, an empty meeting room would be an ideal place for this. You may also need to adjust your lighting and audio levels and it is best to consult with local groups to see what would work best. Giving staff additional training in advance of these viewings can help to make sure that everyone feels welcome. Read our top tips for organising an Early Bird Opening. Water bowls are a thoughtful way to let assistance dogs freshen up on a hot day. We even have our own Euan’s Guide water bowls! Familiarising yourself with what is in your local area can be helpful when advising visitors. For example, some assistance owners may ask where the nearest green space is for their dog to take a well earned break. These are a helpful piece of equipment to have but to be effective they need to be accompanied by signage telling visitors that they are available and be regularly tested. In addition, giving staff training in BSL is a great way to invest in their professional development and it is something that visitors will certainly appreciate. When providing information it's important to make sure it is accessible. Take a look at everything your venue has from leaflets to signage. Are audio versions of leaflets available? Do you have large print versions of menus in the café? Is there a BSL video which welcomes visitors to your museum and tells them what to expect? It might also be a good opportunity to look at the information that is provided for staff and ensure that it is also available in accessible formats. Even if you have the best accessible facilities in the world, they aren’t much use if you don’t tell people about them! 95% of disabled people will search for information about disabled access online before visiting a venue for the first time. Does your venue have information available about its disabled access? Listing on Euan’s Guide is a great way to demonstrate the accessible facilities that you have and let visitors know what to expect from your venue. We can link to your access statement to give visitors the complete picture. Once people have arrived, signage is really important to help them navigate through your building. When it comes to signs, high contrast text and clear directions are best. Signs which have a wheelchair symbol and an arrow can be confusing. It is better to have a sign which says ‘wheelchair access to the cafe’ accompanied by an arrow. Don’t forget to place signs intended for wheelchair users in places that are visible from a seated position. Where would people want to go when arriving or when they are leaving? Is the exit clearly signposted? Are wheelchair accessible evacuation routes signposted? They are not always glamorous but they are often a deciding factor when people are researching for places to go. For best practice, take a look at Changing Places Toilets. Simple adjustments to your accessible toilet can make a huge difference too. For example, removing surplus or oversized bins and other non-essentials will increase the amount of space wheelchair users have to move. Don’t forget to implement your customer service procedure for disabled visitors, too! If you regularly gather feedback from visitors, make sure that you ask disabled visitors for their views, too. If you have a complaints procedure, make sure it is available in accessible formats. This is a valuable way to gather feedback about your accessibility and discover ways to improve. Where you have accessible toilets, lifts or other specialist equipment check they are working on a regular basis. Lastly, did you know that 78% of disabled people will make repeat visits when they find a venue that has good accessibility? 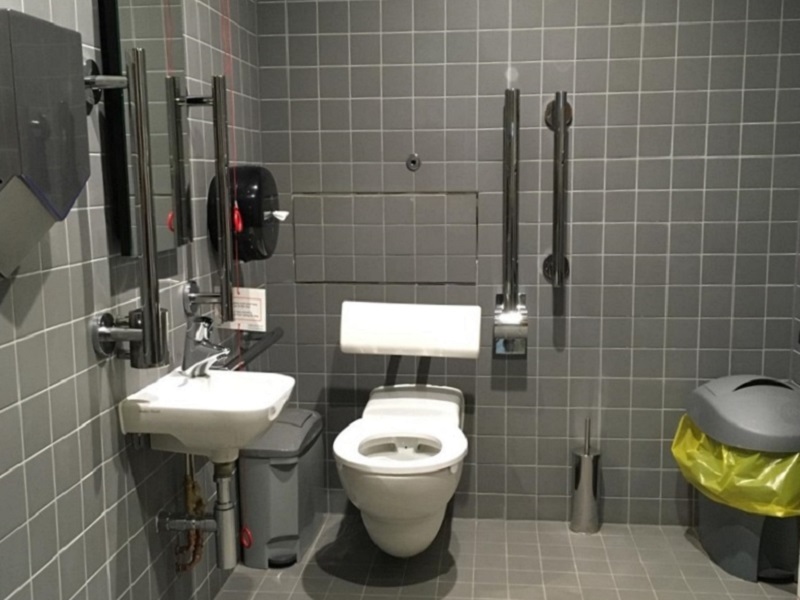 What makes a good accessible toilet?